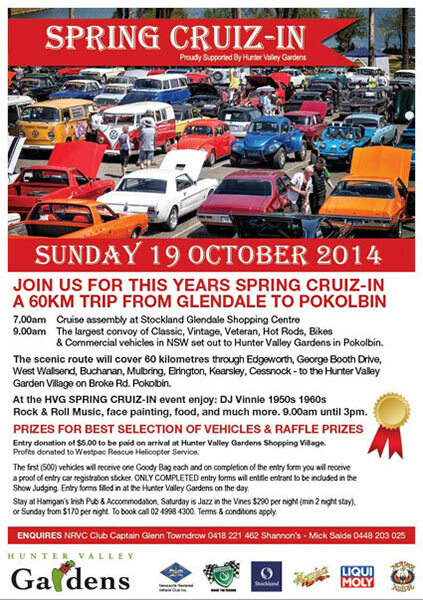 Proudly supported by Hunter Valley Gardens, the 60km Spring Cruiz-In will depart from the Stockland Glendale Shopping Centre and finish at the Hunter Valley Gardens. Meet-up time is 7:00am for a 9:00am departure. The largest convoy of classic, vintage, veteran, hot rods, bikes and commercial vehicles in NSW will set out to Hunter Valley Gardens in Pokolbin. Prizes for best selection of vehicles and raffle prizes. Entry donation of $5.00 on arrival at Hunter Valley Gardens Shopping Village. Profits will be donated to Westpac Rescue Helicopter Service.